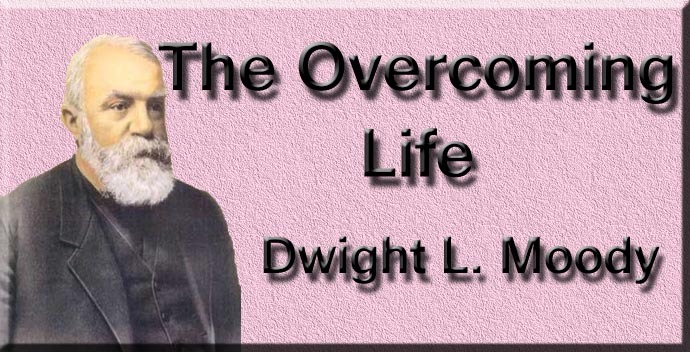 THE OVERCOMING LIFE. - PART I.
I would like to have you open your Bible at the first epistle of John, fifth chapter, fourth and fifth verses: "Whatsoever is born of God overcometh the world: and this is the victory that overcometh the world, even our faith. Who is he that overcometh the world, but he that believeth that Jesus is the Son of God?" When a battle is fought, all are anxious to know who are the victors. In these verses we are told who is to gain the victory in life. When I was converted I made this mistake: I thought the battle was already mine, the victory already won, the crown already in my grasp. I thought that old things had passed away, that all things had become new; that my old corrupt nature, the Adam life, was gone. But I found out, after serving Christ for a few months, that conversion was only like enlisting in the army, that there was a battle on hand, and that if I was to get a crown, I had to work for it and fight for it. Salvation is a gift, as free as the air we breathe. It is to be obtained, like any other gift, without money and without price: there are no other terms. "To him that worketh not, but believeth." But on the other hand, if we are to gain a crown, we must work for it. Let me quote a few verses in First Corinthians: "For other foundation can no man lay than that which is laid, which is Jesus Christ. But if any man buildeth on the foundation gold, silver, costly stones, wood, hay, stubble; each man's work shall be made manifest: for the day shall declare it, because it is revealed in fire: and the fire itself shall prove each man's work, of what sort it is. If any man's work shall abide, which he built thereon, he shall receive a reward. If any man's work shall be burned, he shall suffer loss: but he himself shall be saved; yet so as through fire." We see clearly from this that we may be saved, but all our works burned up. I may have a wretched, miserable voyage through life, with no victory, and no reward at the end; saved, yet so as by fire, or as Job puts it, "with the skin of my teeth." I believe that a great many men will barely get to heaven as Lot got out of Sodom, burned out, nothing left, works and everything else destroyed. It is like this: when a man enters the army, he is a member of the army the moment he enlists; he is just as much a member as a man who has been in the army ten or twenty years. But enlisting is one thing, and participating in a battle another. Young converts are like those just enlisted. It is folly for any man to attempt to fight in his own strength. The world, the flesh and the devil are too much for any man. But if we are linked to Christ by faith, and He is formed in us the hope of glory, then we shall get the victory over every enemy. It is believers who are the overcomers. "Thanks be unto God, which always causeth us to triumph in Christ." Through Him we shall be more than conquerors. I wouldn't think of talking to unconverted men about overcoming the world, for it is utterly impossible. They might as well try to cut down the American forest with their penknives. But a good many Christian people make this mistake: they think the battle is already fought and won. They have an idea that all they have to do is to put the oars down in the bottom of the boat, and the current will drift them into the ocean of God's eternal love. But we have to cross the current. We have to learn how to watch and fight, and how to overcome. The battle is only just commenced. The Christian life is a conflict and a warfare, and the quicker we find it out the better. There is not a blessing in this world that God has not linked Himself to. All the great and higher blessings God associates with Himself. When God and man work together, then it is that there is going to be victory. We are coworkers with Him. You might take a mill, and put it forty feet above a river, and there isn't capital enough in the States to make that river turn the mill; but get it down about forty feet, and away it works. We want to keep in mind that if we are going to overcome the world, we have got to work with God. It is His power that makes all the means of grace effectual. "The white man is against us, governments are against us, the spirit of the times is against us. I see no hope for the colored race. I am full of sadness." My friend, it makes a difference when you count God in. Now many a young believer is discouraged and disheartened when he realizes this warfare. He begins to think that God has forsaken him, that Christianity is not all that it professes to be. But he should rather regard it as an encouraging sign. No sooner has a soul escaped from his snare than the great Adversary takes steps to ensnare it again. He puts forth all his power to recapture his lost prey. The fiercest attacks are made on the strongest forts, and the fiercer the battle the young believer is called on to wage, the surer evidence it is of the work of the Holy Spirit in his heart. God will not desert him in his time of need, any more than He deserted His people of old when they were hard pressed by their foes. This brings me to the fourth verse of the fourth chapter of the same epistle: "Ye are of God, little children, and have overcome them: because greater is He that is in you than he that is in the world." The only man that ever conquered this world--was complete victor--was Jesus Christ. When He shouted on the cross, "It is finished!" it was the shout of a conqueror. He had overcome every enemy. He had met sin and death. He had met every foe that you and I have got to meet, and had come off victor. Now if I have got the spirit of Christ, if I have got that same life in me, then it is that I have got a power that is greater than any power in the world, and with that same power I overcome the world. Notice that everything human in this world fails. Every man, the moment he takes his eye off God, has failed. Every man has been a failure at some period of his life. Abraham failed. Moses failed. Elijah failed. Take the men that have become so famous and that were so mighty--the moment they got their eye off God, they were weak like other men; and it is a very singular thing that those men failed on the strongest point in their character. I suppose it was because they were not on the watch. Abraham was noted for his faith, and he failed right there--he denied his wife. Moses was noted for his meekness and humility, and he failed right there--he got angry. God kept him out of the promised land because he lost his temper. I know he was called "the servant of God," and that he was a mighty man, and had power with God, but humanly speaking, he failed, and was kept out of the promised land. Elijah was noted for his power in prayer and for his courage, yet he became a coward. He was the boldest man of his day, and stood before Ahab, and the royal court, and all the prophets of Baal; yet when he heard that Jezebel had threatened his life, he ran away to the desert, and under a juniper tree prayed that he might die. Peter was noted for his boldness, and a little maid scared him nearly out of his wits. As soon as she spoke to him, he began to tremble, and he swore that he didn't know Christ. I have often said to myself that I'd like to have been there on the day of Pentecost alongside of that maid when she saw Peter preaching. "Why," I suppose she said, "what has come over that man? He was afraid of me only a few weeks ago, and now he stands up before all Jerusalem and charges these very Jews with the murder of Jesus." The moment he got his eye off the Master he failed; and every man, I don't care who he is--even the strongest--every man that hasn't Christ in him, is a failure. John, the beloved disciple, was noted for his meekness; and yet we hear of him wanting to call fire down from heaven on a little town because it had refused the common hospitalities. Now, how are we to get the victory over all our enemies? Turn to Galatians, second chapter, verse twenty: "I am crucified with Christ; nevertheless I live; yet not I, but Christ liveth in me: and the life which I now live in the flesh, I live by the faith of the Son of God, who loved me and gave Himself for me." We live by faith. We get this life by faith, and become linked to Immanuel--"God with us." If I have God for me, I am going to overcome. How do we gain this mighty power? By faith. The next passage I want to call your attention to is Romans, chapter eleven, verse twenty: "Because of unbelief they were broken off; and thou standest by faith." The Jews were cut off on account of their unbelief: we were grafted in on account of our belief. So notice: We live by faith, and we stand by faith. Next: We walk by faith. Second Corinthians, chapter five, verse seven: "For we walk by faith, not by sight." The most faulty Christians I know are those who want to walk by sight. They want to see the end--how a thing is going to come out. That isn't walking by faith at all--that is walking by sight. I think the characters that best represent this difference are Joseph and Jacob. Jacob was a man who walked with God by sight. You remember his vow at Bethel:--"If God will be with me, and will keep me in this way that I go, and will give me bread to eat, and raiment to put on, so that I come again to my father's house in peace; then shall the Lord be my God." And you remember how his heart revived when he saw the wagons Joseph sent him from Egypt. He sought after signs. He never could have gone through the temptations and trials that his son Joseph did. Joseph represents a higher type of Christian. He could walk in the dark. He could survive thirteen years of misfortune, in spite of his dreams, and then ascribe it all to the goodness and providence of God. Lot and Abraham are a good illustration Lot turned away from Abraham and tented on the plains of Sodom. He got a good stretch of pasture land, but he had bad neighbors. He was a weak character and he should have kept with Abraham in order to get strong. A good many men are just like that. As long as their mothers are living, or they are bolstered up by some godly person, they get along very well; but they can't stand alone. Lot walked by sight; but Abraham walked by faith; he went out in the footsteps of God. "By faith Abraham, when he was called to go out into a place which he should after receive for an inheritance, obeyed; and he went out, not knowing whither he went. By faith he sojourned in the land of promise, as in a strange country, dwelling in tabernacles with Isaac and Jacob, the heirs with him of the same promise: for he looked for a city which hath foundations, whose builder and maker is God." And again: We fight by faith. Ephesians, sixth chapter, verse sixteen: "Above all, taking the shield of faith, wherewith ye shall be able to quench all the fiery darts of the wicked." Every dart Satan can fire at us we can quench by faith, By faith we can overcome the Evil One. To fear is to have more faith in your antagonist than in Christ. Some of the older people can remember when our war broke out. Secretary Seward, who was Lincoln's Secretary of State--a long-headed and shrewd politician--prophesied that the war would be over in ninety days; and young men in thousands and hundreds of thousands came forward and volunteered to go down to Dixie and whip the South. They thought they would be back in ninety days; but the war lasted four years, and cost about half a million of lives. What was the matter? Why, the South was a good deal stronger than the North supposed. Its strength was underestimated. Jesus Christ makes no mistake of that kind. When He enlists a man in His service, He shows him the dark side; He lets him know that he must live a life of self-denial. If a man is not willing to go to heaven by the way of Calvary, he cannot go at all. Many men want a religion in which there is no cross, but they cannot enter heaven that way. If we are to be disciples of Jesus Christ, we must deny ourselves and take up our cross and follow Him. So let us sit down and count the cost. Do not think that you will have no battles if you follow the Nazarene, because many battles are before you. Yet if I had ten thousand lives, Jesus Christ should have every one of them. Men do not object to a battle if they are confident that they will have victory, and, thank God, every one of us may have the victory if we will. The reason why so many Christians fail all through life is just this--they under-estimate the strength of the enemy. My dear friend; you and I have got a terrible enemy to contend with. Don't let Satan deceive you. Unless you are spiritually dead, it means warfare. Nearly everything around tends to draw us away from God. We do not step clear out of Egypt on to the throne of God. There is the wilderness journey, and there are enemies in the land. Don't let any man or woman think all he or she has to do is to join the church. That will not save you. The question is, are you overcoming the world, or is the world overcoming you? Are you more patient than you were five years ago? Are you more amiable? If you are not, the world is overcoming you, even if you are a church member. That epistle that Paul wrote to Titus says that we are to be sound in patience, faith and charity. We have got Christians, a good many of them, that are good in spots, but mighty poor in other spots. Just a little bit of them seems to be saved, you know. They are not rounded out in their characters. It is just because they haven't been taught that they have a terrible foe to overcome. If I wanted to find out whether a Man was a Christian, I wouldn't go to his minister. I would go and ask his wife. I tell you, we want more home piety just now. If a man doesn't treat his wife right, I don't want to hear him talk about Christianity. What is the use of his talking about salvation for the next life, if he has no salvation for this? We want a Christianity that goes into our homes and everyday lives. Some men's religion just repels me. They put on a whining voice and a sort of a religious tone, and talk so sanctimoniously on Sunday that you would think they were wonderful saints. But on Monday they are quite different. They put their religion away with their clothes, and you don't see any more of it until the next Sunday. You laugh, but let us look out that we don't belong to that class. My friend, we have got to have a higher type of Christianity, or the Church is gone. It is wrong for a man or woman to profess what they don't possess. If you are not overcoming temptations, the world is overcoming you. Just get on your knees and ask God to help you. My dear friends, let us go to God and ask Him to search us. Let us ask Him to wake us up, and let us not think that just because we are church members we are all right. We are all wrong if we are not getting victory over sin.